Atheist Propaganda: Still trying to sell the banana argument? To kids? Still trying to sell the banana argument? To kids? There was a comment on my last Way of the Master post wondering why Kirk and Ray haven't learned their lesson after the banana fiasco. I'd just like to point out that they have not learned anything, and in fact are still selling a book aimed at children, with a picture of Ray holding a banana on the front of it. (If you're not familiar with the banana fiasco, I'll tackle it in another post another time). 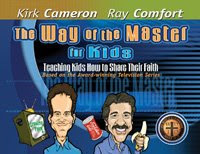 Ray and Kirk, you are stooping so low by continuing to sell this book! Your argument about the banana has been discredited so thoroughly and embarrassingly, that most people would have destroyed all evidence that they ever tried to make it! Yet you continue to target this book, containing the banana argument, not at thinking adults, but at impressionable kids! You continue to sell lies and intellectual dishonesty, hoping that the kids will not be smart enough to figure out your ruse, and that their undeveloped minds will allow them to accept your argument and be indoctrinated into the stupidity which you continue to spew forth. Do all of these books come with a sticker saying that the banana argument has been discredited? That the modern banana is a creation of humans? That if your god did indeed create bananas, that we have done a better job than it by making bananas more convenient and tasty? Since you do have bumper stickers on your site, I'll assume that you are capable of making stickers. Make one that says, "The bananas that you buy in stores have been demonstrated to be a creation of humans, and only vaguely resemble the forms found in nature, which are not convenient for human consumption. ", and put it on all books that you sell to these unfortunate kids. They might as well market their schlock to children. Children and those with childlike minds is all it's worthy of.